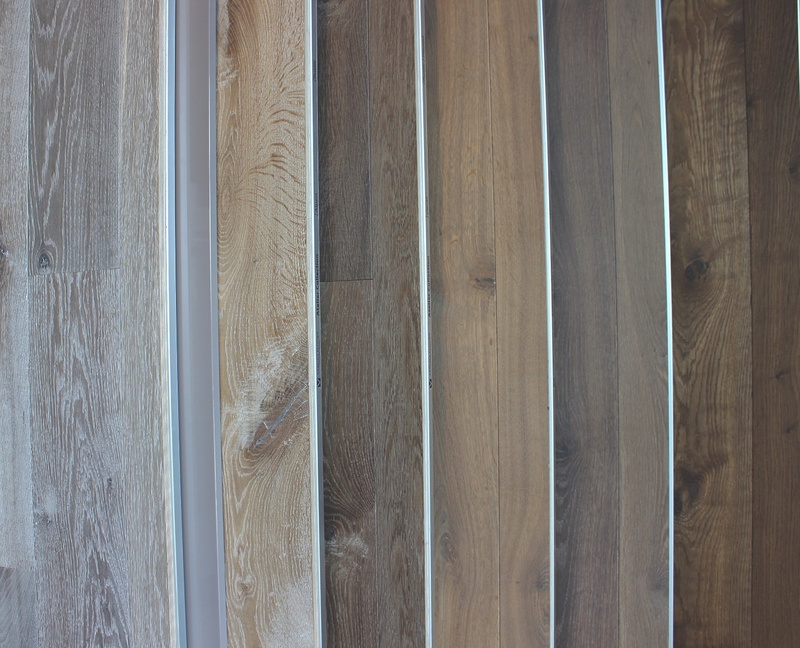 Once you’ve chosen an engineered hardwood flooring product in your favourite style and colour, you may select the pattern you wish to install your floors in. There are a variety of patterns you can use when installing hardwood flooring. While traditional straight and horizontal designs are most common, you can choose a patterned design to create visual interest. A patterned design, such as parquet flooring, herringbone flooring, and chevron flooring will elevate your hardwood floor by making it beautiful design element in your space. 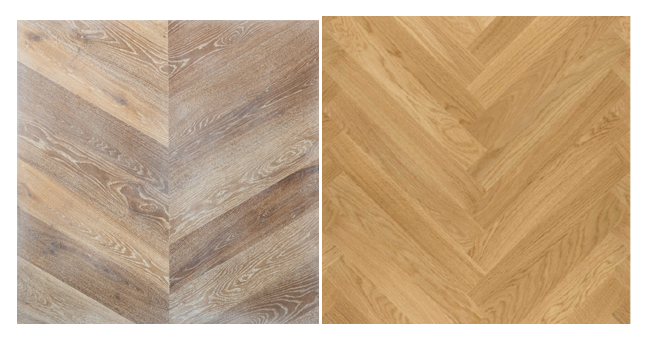 Two of the most popular flooring patterns are chevron and herringbone, but how do you know which style is best for your space, style, and needs? Installing a chevron hardwood floor has been trendy in recent years, making it a modern and fashionable choice. It’s an appropriate design for homeowners who want to create a vintage Parisian or European feel in their spaces. The chevron pattern requires boards that meet at mitered angles, creating a diagonal zigzag pattern in long, parallel stripes. Adds an instant luxurious European design feel with visually distinctive lines. Creates visual interest through diagonal lines. Creates a feeling of movement through the ‘arrows’ that are created where the boards meet. Produces a dramatic effect, even when a less exotic wood is used. Looks trendy, fashionable, and classic. Less expensive and time-consuming to install than herringbone. 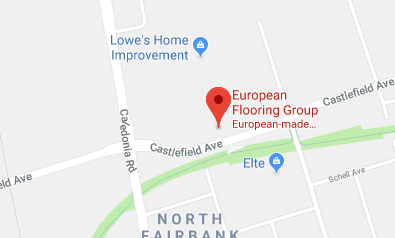 Usually a special, custom-order flooring. 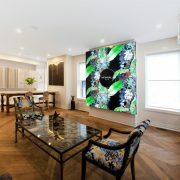 An appropriate scale for the pattern must be used, depending on the room’s size, otherwise the visual impact can be lost. The herringbone pattern is similar to the chevron pattern, as they both create a diagonal, zigzag design. 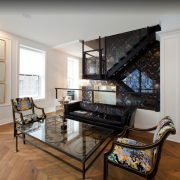 However, herringbone’s unmitered edges create a more ‘broken’ zigzag design. A herringbone hardwood floor is appropriate for homeowners who want a more classic, traditional look in their spaces, while still creating visual interest. Requires fewer cuts, which means less wood is wasted. Creates a more subtle pattern than chevron. Provides visual interest without being distracting. Is considered a more classic and traditional flooring design. Does not create the illusion of length. Requires mitering where the planks meet the walls. 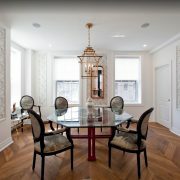 No matter what pattern you choose for your new hardwood flooring, including parquet floors, herringbone, and chevron, European Flooring is committed to providing our customers with a variety of contemporary and classic hardwood flooring styles, so you’ll always find the best style, finish, and colour for your space. 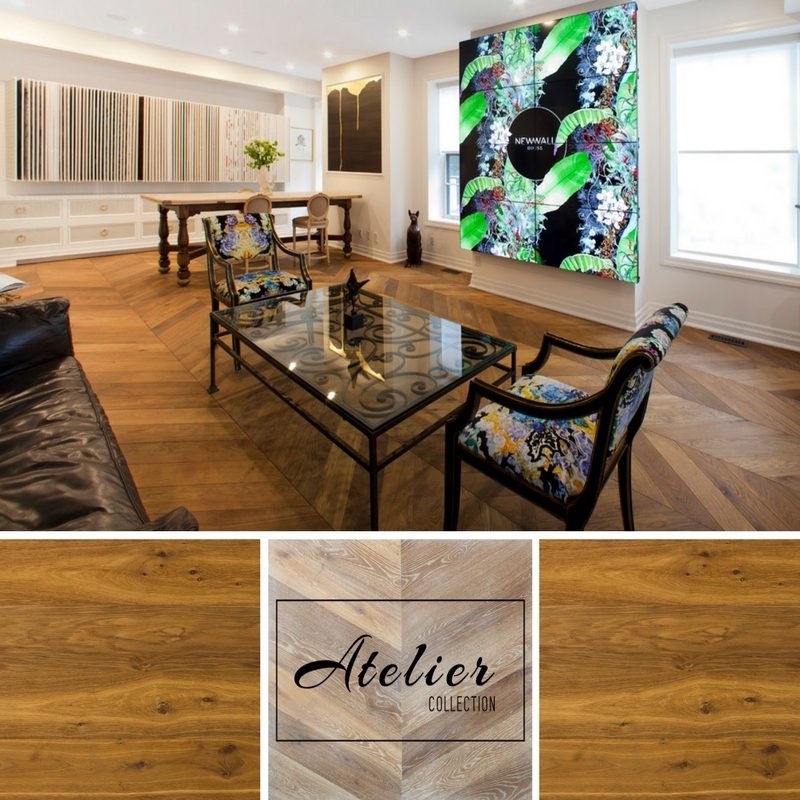 Book an appointment to visit our designer showroom in Toronto to explore our engineered hardwood flooring options. We also offer our customers certified professional installation services. 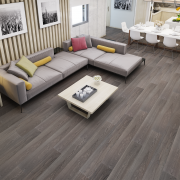 Contact us to book a showroom appointment and talk to our flooring experts to learn more.